Let the Games Begin (Che la festa cominci) is the latest novel by Italian writer Niccolò Ammaniti. He’s probably best known for Io non ho paura (I’m Not Scared), the 2001 novel that became a film in 2003. A pretty broad satire of contemporary Roman society, Let the Games Begin is passingly entertaining, but it suffers from less-than-perfect translation and editing. As well as some fairly rudimentary editorial errors, the idiomatic translation doesn’t feel quite right. It’s also quite haphazard with its translation of Italian food names. While it’s content to refer to supplì as supplì, it seems to determinedly translate cornetto as croissant. A cornetto (“little horn”) is not a croissant (French for “crescent”). Nor is it an ice-cream. It’s an Italian relative of the croissant, likely with the same origins, but today a distinct product. Sure they look similar, but they’re slightly different. Read on. No one is in agreement about the origins of the crescent-shaped pastry, but one abiding story (or myth) is that it was invented in Austria to commemorate the defeat of the Ottomans, who besieged the city in 1683. Wikipedia gives more background. Whatever the origins of the pastry (other variables include chiffel and kipfel), since its birth the regional and national versions have diverged. 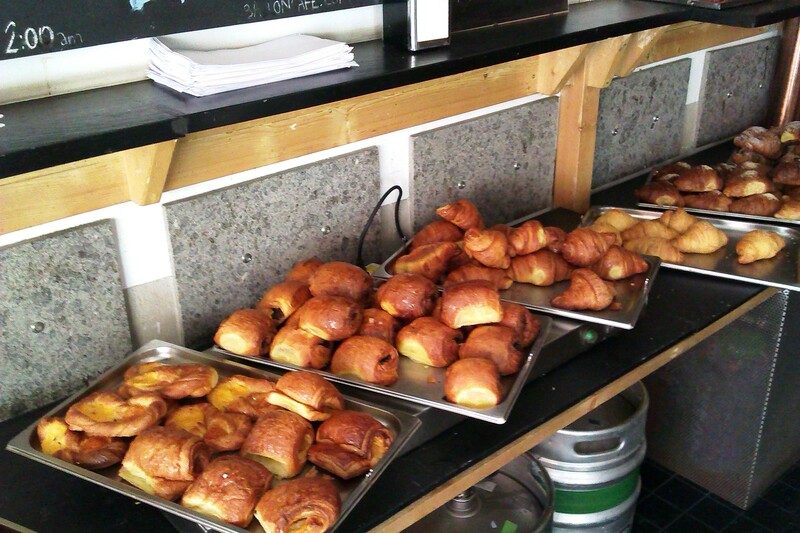 Both the croissant and the cornetto are breakfast pastries. 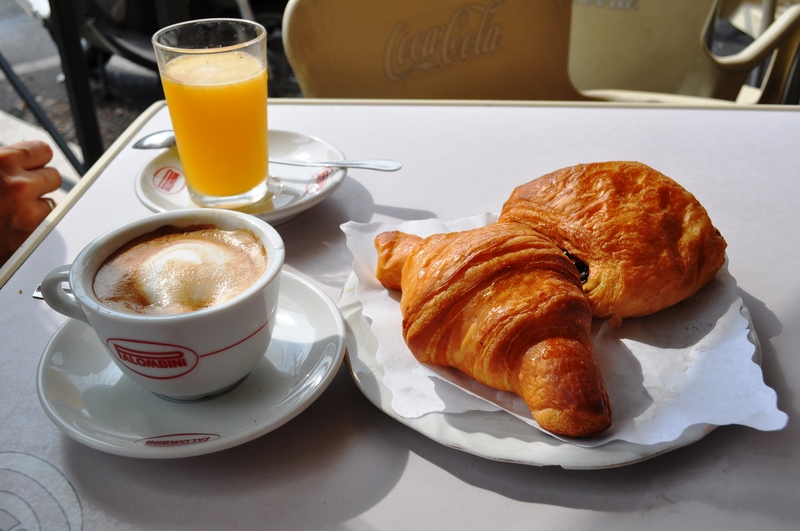 The quintessential breakfast I witness being consumed day-in day-out in Rome is a coffee – either a simple caffè (espresso) or cappucino (often just called cappuccio in Rome) – with a cornetto, normally just a cornetto semplice (“simple”, ie plain). 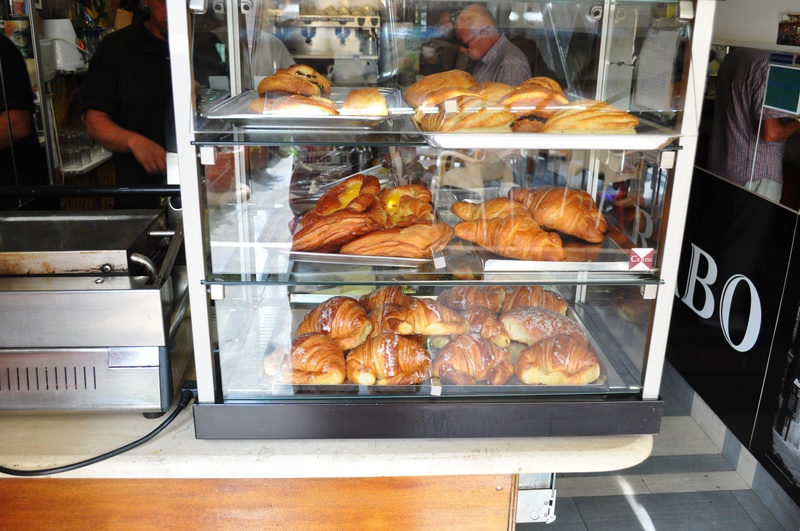 Many cafés offer a large selection of different breakfast pastries, or lieviti (literally “yeasteds” or “risens”, meaning pastries made with a yeasted dough) and if possible I get a saccottino al cioccolato. In Italian, a sacco is a sack, so this literally is a “little sack with chocolate”. And yes, it closely resembles another French – or Viennese – pastry: the pain au chocolat, known by many ignoramuses as a “chocolate croissant” . Guys, it’s not a crescent-shape, so how can it be a croissant? The cornetto semplice is also apparently also known as the cornetto vuoto (“empty”), to contrast it with various types of cornetti ripieni (“filled”). These include cornetto alla crema (with custard), alla marmellata (with jam, marmalade or other conserve), al miele (with honey; this is often made with an integrale, wholewheat, dough), and cornetto al cioccolato. The latter is an actual cornetto that is usually filled with that vile brown vegetable-oil product beloved of Italians, Nutella. The French really don’t go in for all these filled variables, beyond ones with almond paste, but the biggest difference between cornetti and croissant is the lamination. A proper croissant must be made with butter, and must be repeatedly folded and rolled, to achieve a lamination wherein the rolled dough contains several thin layers of the fat. When the croissant is baked, water in the dough is turned to steam, but this is trapped by the fat, causing pressure and rising between the layers. The resulting pastry, when done right, should be crisp and flaky, with a taste of butter but no greasiness. A cornetto on the other hand isn’t so assiduously laminated, and can even be made with lard, not butter. The dough also contains more sugar. The result is a pastry that is just a lot sweeter than a proper French croissant, and can have a more enriched bread or cake-like texture, more like a French brioche. Some cornetti are very flaky and like croissants, but many others are more cakey; there’s a lot of variation. Indeed, cornetti are sometimes called brioche in some northern parts of Italy, though in Naples, Sicily and parts of south with a historical French influence, the name brioche is used for a pastry more like the Gallic version. But that’s another story. Our lifestyle at the moment takes us to two cafes regularly for weekend morning cornetti. I’m not saying these have the best cornetti in Rome – how could I, without sampling cornetti in every single one of the thousands of cafés and pasticcerie in Rome? – but they’re places we enjoy. The first is Baylon, which we started frequenting because… well, I can’t really remember. They’re so grumpy and resolutely unfriendly that even after we’ve been going there two years only one of the staff actually acknowledges us. The Ricardo Darin-lookalike is a particular sourpuss. Unlike many more traditional Roman cafés, however, it has space to hang out, and Wi-Fi. Plus, unlike many places in the tourist nexus of Trastevere, they don’t charge stupid prices. So we keep on going back – partly for the space, partly as we can get our Saturday morning weekly English language paper nearby, and partly because they it has great selection of lieviti. Apparently it used to be a local landmark pasticceria (pastry bakery), so at least they have their own kitchens for the baking. Our Sunday routine, on the other hand, developed as we used to go down to the farmers’ market in Testaccio’s Ex-Mattatoio every week. Although that’s now sadly been shunted further out of town, at least a direct-from-farm shop has opened near Ponte Testaccio, on the Trastevere Station side of the river, where we can get many of the same quality fresh products. There’s also Porta Portese market every Sunday, with its enormous selection of tat, junk and bric-a-brac. On our route down the hill from our house, via the massively grand 19th century, weed-infested, broken-glass strewn, graffitied Ugo Bassi steps, we go to Caffè Arabo on Viale di Trastevere. This is a more traditional Roman café, no Wi-Fi or anything of that poncy nonsense, but it’s still kinda idiosyncratic. Plus, a couple of the staff not only recognise us but are friendly, even amiably laughing at my ordering a (hot) tea on a hot day. “The British drink tea in every season, every weather,” I shrugged. They don’t have a kitchen, so their cornetti are bought-in, but they’re not bad. And occasionally they even have saccottini al cioccolato to satisfy my chocolate cravings. Neither places, however, has croissant. 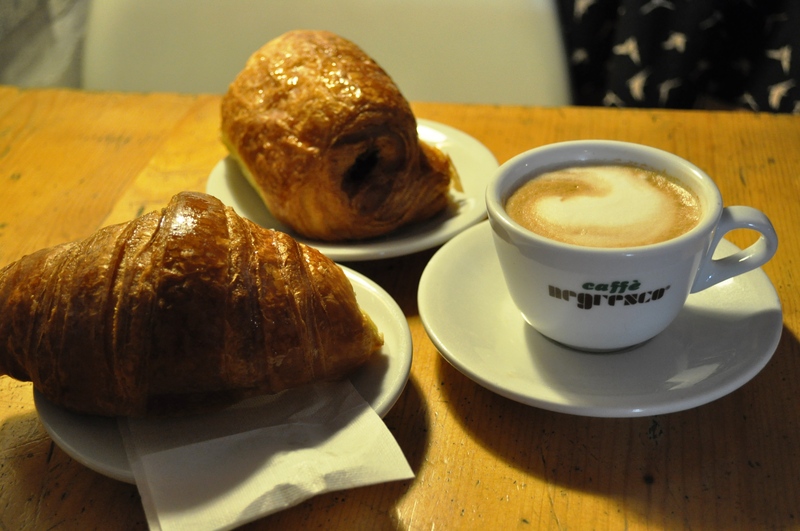 A few Roman cafés do apparently do French-style croissant, but I’ve yet to sample them. Of course, not everyone has a coffee and cornetto for breakfast or elevenses here in Rome. We sat down at Arabo last Sunday, Fran ordered a cappucino and cornetto, I ordered a spremuta d’arancia (freshly sqeezed orange juice) and a saccattino al cioccolato – then two guys sad down beside us and ordered beers. It was 10.30am. They are the best cafes, the ones without numbers. Porta Portese amazingly has been going forever, I certainly used to rummage there when i lived in Rome in the 70s..
.Wonderfully precise description of croissant vs cornetto, thank you. You’re welcome. I wonder what you’d make of Porta Portese now – I suspect there’s a lot more made-in-China, made-in-Bangladesh sweatshop junk now (it accounts for at least 70% of the market I’d say). I’m sure I read somewhere that the modern incarnation of the market developed at the end of WW2 when there were such shortages, and a lot of black market and second-hand trade. Though I can’t find the info now. I love seeing the market in the 1948 film Ladri di Biciclette. Must watch it again somewhere…I guess it’s the way of all true fleamarkets, Camden Lock has really ballooned and commercialised, too. Miss my 2x daily dopio cappuccino forte and and morning cornetto from Napoli!!! Great detail, you make the all important distinctions between Cornetti and Crossaint. I still think the french do it better, more butter less sugar. Yes, I think I might have to agree with you Alice. I love cornetti (and – especially – saccontini al cioccolato), and really miss a good Roman breakfast, but you can’t beat good French flaky lamination. I moved to rome last year. I had issues with having a cornetto for breakfast , however, I found a bar near my home that has a flaky version of semplice and integrale that are enjoyable and pleasant. I have not sampled a croissant here yet. I know the Baylon cafe, never did breakfast there. I felt the same way about the place until I had an above and beyond experience of customer service. That truly converted me. Enjoyed the post ! I live in garbatella, i like that you have many great places near me on your blog. I will have to test them all out…when will you guys return? Love Garbatella, one place I’d like to live. Not sure when we’ll return though. A few trips now and then, but not sure about actually living in Roma again. I suspect some of the places I mention may have changed already – although it sounds like Baylon is the same as ever; mostly grumpy with the occasional burst of friendliness. That perfectly describes Baylon ….Garbatella has so many great restaurants .I will check if some places are still around. I’m planning a trip to Italy in 2016 so this was a fun, informative read. Grazie! Hi Daniel, I recently discovered your blog and thanks for this clarification. I’ve been based in Turin for several years now and I, like many locals have been calling these crescent shaped pastries brioches or croissants. Having lived in France for a year, I can vouch that the taste of French croissants is much more buttery and flaky. And, they are not into the fillings that the torinesi are into (i.e. crema al cioccolato/gianduia, crema pasticcera and marmellata) at all. I’ll have to tell my hubby not to call them croissants anymore. They’re still pretty good though! Glad to help. Yes, I love croissants and cornetti equally (good bakery ones that is, not rubbish factory ones). I guess there’s a stronger French cultural presence in Toronto than Italian? That is correct absolutely correct Daniel! Hi, this is a nice article! I’d like to add that cornetti are older than croissant. Oh, about the chocolate version: that one is different from the cornetto filled with Nutella. There are places where you can find only the Nutella variant or vice versa and there are places who have both of them. You can always ask for that. Expecially the best bakeries will never serve you a cornetto with Nutella.